The Kilpatrick Format synthesizers and some other products are available to order directly from us. Please ask us if you have any questions regarding availability of a product. Many products are also carried through our amazing network of dealers worldwide. Kilpatrick Audio sells its own products world-wide through respected dealers. Please contact an authorized dealer near you. Also do let us know if you have any questions and we will do our best to help you. Redefining the small desktop effects market, Kilpatrick Audio offers studio-grade reverb algorithms and easy to use controls in a small rugged unit. Finally a desktop reverb unit designed specifically for electronic musicians and producers. Offering rack-mount quality in a portable package REDOX will become your go-to hardware reverb. Building upon the success of the K4815 Pattern Generator, CARBON takes pattern-based sequencing to a whole new level. Supporting polyphony, multiple tracks, editing and scene-based operation, CARBON offers a whole new approach to composing and performing. The patchable modular synth experience is now available in a compact, affordable package. With the excitement of a full-sized modular synthesizer packed into a fun table-top unit, PHENOL includes tons of amazing features. But the best part is that it sounds fantastic! Enjoy the great outdoors, but keep patching with PHENOLgo! This handy accessory will let you power your PHENOL from a USB battery bank or solar panel. Plug in some headphones and jam anywhere! Also works with CARBON! The Kilpatrick Format Synthesizer is a completely new format for modular synthesis designed to offer the best combination of features, ease of use, and performance. But most of all the Kilpatrick system is fun! 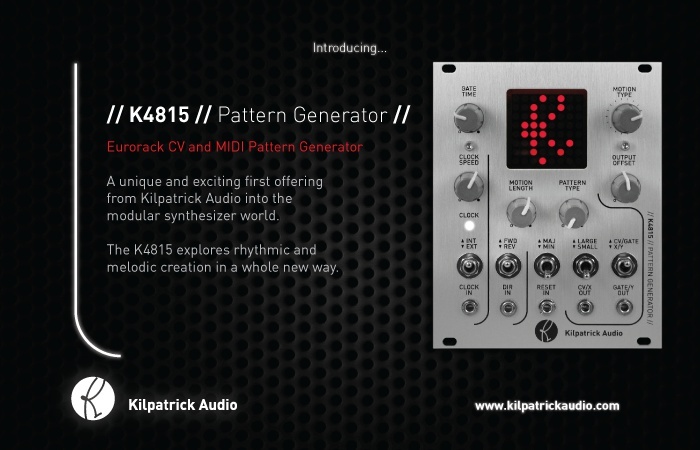 Whether you want experimental sound creation or a more tonal synthesis experience, check out the Kilpatrick format. Small and powerful, the K6100 Panning VCA offers two flexible VCAs in a stylish package. Use it as a panner, a stereo VCA, or two mono VCAs. By popular demand you can now get the unique power of the PHENOL envelope in a Eurorack module! Treat yourself to one of the best analog oscillators available! Based on the success and sound of the K3020 Dual VCO, the K3021 Master VCO packs the same sound into a smaller and more affordable package. Completely redesigned from the ground up, the K3021 Master VCO is ready to amaze you. Yes, we have done it! The K6501 PHILTER captures the incredible sound of the PHENOL filter in a Eurorack module! Enjoy the fat, nasty (in a good way) sound of the PHENOL filters in a compact module that is sure to always be in your signal path. A unique and exciting first offering from Kilpatrick Audio into the modular synthesizer world. The K4815 explores rhythmic and melodic creation in a whole new way. Explore modular synthesis like never before with the K3020 Dual VCO. Pure analog sound with some important digital conveniences, the K3020 is ready to take your modular system to an entirely new level. Enjoy the power of MIDI with your K4815 module by adding MIDI ports with the KMIDI. Building on the popular K4815 Pattern Generator, the K4816 offers Buchla users this incredible module with a built-in MIDI interface, CV control inputs and many new features. New units available in 2018! Looking for our legacy products? © Copyright 2019 Kilpatrick Audio / QP925 Trading Corp.